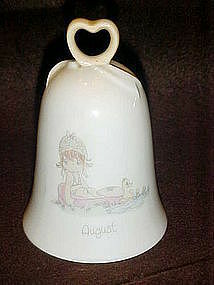 Precious Moments month of August porcelain bell. Precious Moments child sitting in a wading pool with her little duck. Heart handle, clapper intact too. Measures 4 1/2" tall. Made by Samuel Butcher, Enesco 1988. Perfect condition.